(Minna no Kobito) by Toshitaka Nabata, or loosely translated as ‘Everyone’s Kobito’. I made them for the Once Upon a Thread event at No Big Dill. Check out my story and pictures over there! 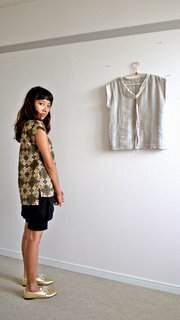 The fabric is cotton knit, very soft and comfortable. 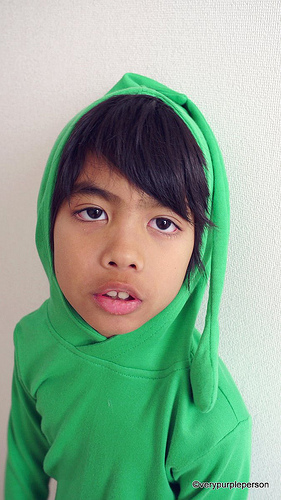 The hoodies will be good addition for Sidra’s wardrobe in spring. 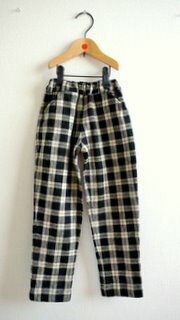 The body of the T-shirt and pants are made with commercial pattern. Knit fabric, about 1.25 meters (fabric width is 110 cm), if you want matching pants, you will need 2.25 m.
If you want to make matching pants, you will need a pattern. 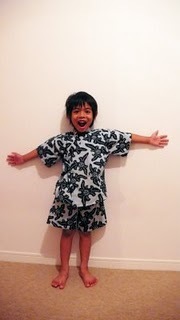 I use Nature Walk pattern from Oliver+s. 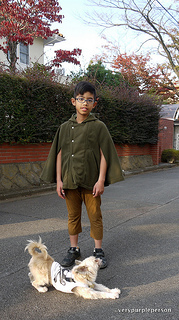 note: you can also use store-bought long-sleeved T-shirt and pants and unpick the seam from the neckline. Buy another T-shirt in the same color to be cut for the hood. Make T-shirt per pattern instructions, leave the neckline unfinished. If you use store-bough T-shirt, unpick the seam on the neckline and leave it raw. Measure the neckline of your T-shirt and compare it to the neckline of the hood pattern. 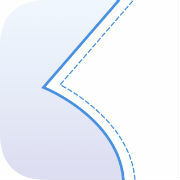 Adjust the hood pattern accordingly, using the shoulder seam placement mark as guideline. Add seam allowance to the pattern. Cut 4 pieces of fabric from hood pattern. 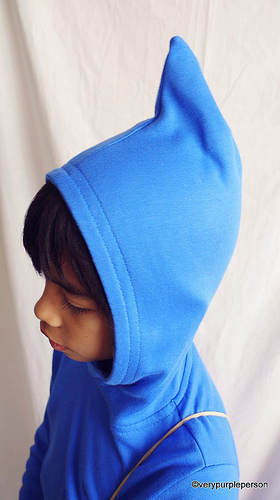 You will have two pair of hood pieces, one pair is for the inside and the other pair is for the outside. Place each pair with right side together. Sew the back and top side. Clip corner and curves (you don’t have to do this if using serger). Turn one of the pair inside out and place in the second pair. Sew the front seam. Clip curves and turn right side out. Topstitch about 2 cm from the edge. Overlap the front of the hood on the center front placement mark. Baste in place. Pin the hood pattern on the T-shirt neckline, matching center back, shoulder seam, and center front. Sew hood on T-shirt. Topstitch around neckline. You will have two pair of hood pieces and a pair of tentacle pieces. Don’t forget to add seam allowanced to pattern beforehand. Sew the tentacle pieces with right sides together. Clip curves and turn right side out. If you want, insert a bit of fibre filling at the end of the tentacle, don’t stuff too much! On the outside pair of hood: place the tentacle on the placement mark near the top. Sandwich the tentacle between fabric. Baste or pin to secure. Continue making hood as described for hood without tentacle. Be careful to not catch the tentacle when sewing the top of hood. Don’t worry if you don’t have a serger. I don’t have a serger either, so I only use sewing machine. Use ballpoint needle for sewing knits. It has a blunt point that won’t pierce the fabric. I use zigzag stitch set on 0.5-1 for width and 2.5-3 for length. You can also use stretch stitch if your sewing machine has one. You can use zigzag stitch or pinking sears for finishing raw edges. However, I leave the raw edges as they are because knits don’t ravel. Different knits behave differently. 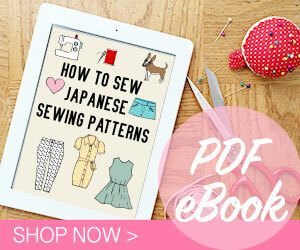 Test your stitches on fabric scraps before you start!